In Britain, Argentine Diego Simeone is best remembered as the man whose reaction to a petulant kick by David Beckham resulted in the England star famously being sent off during a World Cup game in 1998. That is a harsh reflection on his playing career, though, because Simeone was a magnificent midfielder, winning 106 international caps and starring in Serie A for Inter Milan and Lazio as well as guiding Atletico to a league and cup double in 1996 (their most recent La Liga triumph). And now, Simeone is carving a new career as one of the game's hottest managerial properties, with his approach to coaching mirroring the blend of winning attitude and technical aptitude that characterised his playing days. If you asked Diego Simeone how his Atletico Madrid team have overcome all the odds to progress to the Champions League semi-finals, where they will face Jose Mourinho's Chelsea, as well as topping La Liga with just six games remaining, he would provide you with a simple answer: "Hard work and humility." Indeed, that is exactly the mantra he has been preaching on a weekly basis this season, as the football world continues to wonder when - or if at all - his steamroller of a team will finally run out of puff. Until recently, most people assumed it would simply be a matter of time. When, not if. But Wednesday's famous victory over Barcelona, where Atletico succeeded in knocking the Catalan team out of the Champions League before the last four for the first time since 2007, sent a loud and clear message: Atletico Madrid are for real. To a great extent, Simeone's assessment of his Atletico team's greatest strengths - hard work and humility - is absolutely right. 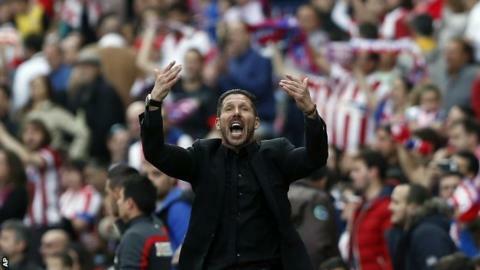 Atletico were only four points above the La Liga relegation zone when Diego Simeone became coach in December 2011. Within 18 months he had guided them to the Europa League, Uefa Super Cup and Copa del Rey titles. The discipline, intensity and sheer, uncompromising effort of their play is unrivalled. That was never more evident in the opening stages on Wednesday, when Atletico's whirlwind of attacking pressure simply blew Barcelona away, resulting in Koke netting the only goal of the game and David Villa thumping shots against the woodwork twice inside the opening 20 minutes. Hard work and humility - as well as, to use Simeone's other favourite phrase, going from game to game - have allowed Atletico's bunch of largely unheralded journeymen, none of whom (with the exception of Villa) were superstars before they arrived at the Vicente Calderon, to barge their way without an invitation into the upper echelons of world football. For any football fan who has become cynical about the modern game's tendency to be ruled by huge dollops of money, Atletico's unstoppable rise has been a breath of fresh air. In the days of Arab sheikhs, Russian oligarchs and American business tycoons, low-budget teams like Atletico simply aren't supposed to do this well. Yet here they are, with less than six weeks of the season remaining, still in strong contention for the two most prestigious prizes on offer. That is, indeed, largely down to the relentless work ethic instilled by Simeone. But it would be very wrong to suggest that Atletico's current success is simply down to the fact that they run around a lot, because there is also a huge amount of quality and intelligence within their ranks. That starts on the training ground, where Simeone and his gruff assistant Mono Burgos prepare the perfect tactics to suit their team's strengths. Under Simeone's instruction, Atletico are defensively disciplined, unsurpassably organised and play with great game awareness, knowing when to press ferociously in numbers and when to sit deep, waiting for the right opportunity to pounce upon their hapless opponents and launch a rapid, pinpoint counter-attack. As the eloquent Argentine boss explained in the build-up to his team's latest triumph, Barcelona's strength lies in controlling possession; Atletico's lies in controlling space. Simeone's attention to detail and his ability to clearly communicate his plans ensures that his players have mastered the art of playing the game where they want to, while simultaneously forcing their opponents into areas where they feel uncomfortable. More than anything, though, Simeone's unbounding positivity and unshakeable belief that good habits, when consistently applied on a day to day basis, will lead to winning performances has succeeded in completely turning Atletico's image on its head. For years, Madrid's second team suffered from a severe inferiority complex as neighbouring Real ruled the roost and the rest of Spain derided them as hapless bunglers who always managed to somehow mess everything up. That reputation was most famously captured in a notorious television advert, when a forlorn young boy asked his frowning father: "Porque somos del Atleti?" Why are we Atleti fans? It was a sort of Spanish equivalent to "Accrington Stanley…who are dey?" and illustrated the inescapable sense of inevitable doom which habitually engulfed Atletico fans as they lurched from disaster to disaster. Under Simeone, Atletico are finally shattering that conception; their manager is even an image of vibrant self-belief as he prowls the touchline during games, constantly turning to the crowd and vigorously urging them to applaud the players for their wholehearted effort. When referee Howard Webb blew the final whistle at the Vicente Calderon on Wednesday, tremendous scenes of jubilation were unleashed, with the home fans - chanting and singing with a relentlessness almost matching their team - refusing to leave the shaking stadium until their heroes re-emerged from the tunnel to embark upon a celebratory lap of honour. As the players finally gave way to those demands and dragged their weary bodies back onto the pitch, to be sportingly saluted even by the travelling Barcelona fans, one man was conspicuous by his absence. Diego Simeone was apparently nowhere to be seen. But he was there all right, hiding on his own at the back of the dugout, quietly watching the scenes of celebration he had helped to create with obvious pride, seemingly struggling to force back tears. After the hard work, the humility. Former Liverpool and Republic of Ireland forward Michael Robinson, who finished his playing career in Spain and is now the country's foremost television pundit, concluded his rhapsody over Atletico's performance by enthusing: "It's impossible not to admire them." Robinson is exactly right. "Why are we Atletico fans?" Right now, the more pertinent question is why anyone wouldn't be.